Pedal through history, on trails, up hills and down mountains. 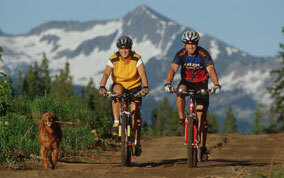 Cycling of all sorts - freeride, cross-country, trail and on-road - can be found throughout West Kootenay. The Kaslo/New Denver area alone is filled with unforgettable destinations that run through and to towns, historic sites, river valleys, hillsides and summits. The Kootenay Rockies' Bike Vacation Guide recommends the following. For more information, visit www.BikeKootenayRockies.com. Kootenay Lake is a fishing paradise: Kokanee salmon (inland sockeye), sturgeon and hard-fighting Dolly Varden and Gerrard Rainbow trout. It's not uncommon to land Gerrard Rainbows that tip the scales at nine kilograms (20 pounds) or more and deliver lots of action: aerials and long, hard runs. Tackle, rod and humour included in every charter; accommodation available. Fully guided day trips as well as all inclusive packages including lodging, incredible meals and licenses. The narrow Kootenay Lake Valley is ideal for windsurfing. Beachstart right from Bulmer's Creek or get under-way at any of the numerous marina and launches up and down this 144-kilometre long lake. A narrow section on the west arm of the lake near Nelson is known for its boiling water. A beautiful championship 18-hole course south of Bulmer's Pointe. Casual atmosphere with full-service clubhouse, pro-shop, full practice facilities, cart and club rentals. A prestigious 18-hole Les Furber designed facility complete with a driving range, putting green, a full fleet of rental carts and a new first-class clubhouse. Front nine is carved neatly through a forested region with sand and water hazards, and the back nine uses the mountains to provide elevation from tee to green. A nine-hole course with the meticulous greens and fairways. More than 80 years of grooming and care have gone into this public course. Located on Oak Avenue; reasonable rates accommodate players and groups of all ages. A perfectly maintained nine-hole course with a relaxed atmosphere and unique challenges for every golfer. Season's passes, bulk passes, club and cart rentals are available. The course is open from mid April to October, and is just 10 minutes from the Kootenay Lake ferry. Great golf, great value. This Bill Newis-overhauled course overlooks Nelson, one of Canada's most celebrated mountain cities. Splendid views of Kokanee Glacier Provincial Park and hilly terrain featuring a number of risk-reward holes requiring precise shot-making. 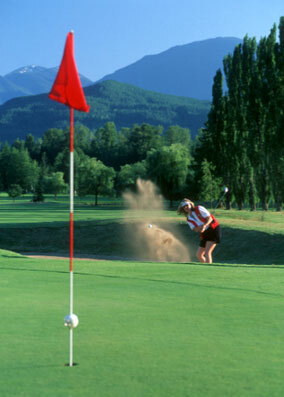 For more information about golfing in West Kootenay or a copy of the 2007 Golf Vacation Guide, call 1.800.661.6603 or visit www.kootenayrockies.com. This vast, fascinating and wild trail named for Earl Grey, Canada's General Governor from 1904 to 1911, covers the entire northern tip of the Purcell Wilderness Conservancy. It extends about 61 kilometres from near the town of Argenta on Highway 31 to Toby Creek, north of Invermere off Highway 93. Only the most seasoned backcountry hikers should attempt the entire route; several attractions and destinations along the trail make it ideal for shorter hikes. Visit www.env.gov.bc.ca/bcparks/explore/parkpgs/purcell.html for maps, detailed descriptions and tips. Another spectacular through into the Purcell Wilderness Conservancy, this old mining trail winds for 12 kilometres up the steep walls of the Fry Creek Canyon. Trail conditions are demanding, but the views, forests and untouched beauty in this area are worth the visit. The trailhead is at Johnston's Landing, near Bulmer's Pointe. Visit www.env.gov.bc.ca/bcparks/explore/parkpgs/purcell.html for maps, detailed descriptions and tips. A well-travelled trail in Kokanee Glacier Provincial Park. The route is moderately difficult and covers nine kilometres (5.6 miles) but travellers are treated to views of the Kokanee Glacier, Sunset Pass and Joker Lakes. A moderate trail that begins climbs a 1,000 metres over 12 kilometres through the incredible Slocan Lake valley to the shore of Beatrice Lakes in Vahalla Provincial Park. Also see Kathy Copeland's guidebooks Don't Waste Your Time in the Kootenays: The Opinionated Guide and Where Locals Hike in the West Kootenay: Premier Trails in S.E. British Columbia near Nelson & Kaslo. Kayaking, canoeing and rafting possibilities are almost endless in the West Kootenays, where the water goes from mild to wild, depending on your destination, abilities and interests. Choose from easy shore hugging routes along the Kootenay Lake's shores or notch up the adventure with trips down Slocan River, Koch Creek, Lardeau River or Wilson Creek. Abundant scenery and wildlife are always just a glance away. This reliable and friendly Nelson ski resort was established more than 70 years ago. Whitewater has more than 25 runs and receives about 10 metres (39 feet) of snow every season. Base elevation is 1,640 metres (5,400 feet) and runs include steeps, deeps, chutes, bowls, groomed cruiser and gentle rollers. Nordic and backcountry skiing also offered. Ski Canada describes Red Mountain as �heaven for experts.� The runs don't stop at the traditional black-diamond rating: more than 25 runs are signed as �extreme caution.� Beginner and intermediate skiers and boarders will also find lots of terrain at this 585-hectare (1,200-acre) resort only 10 minutes north of the U.S./Canada border. Rossland also offers a variety of accommodation and a number of great restaurants and shops. Stellar Heliskiing is located at the north end of Kootenay Lake, nestled high on the Selkirk and Purcell mountain ranges. Stellar Heliskiing has opened a wonderland of big-mountain terrain for your heli skiing and snowboarding pleasure. Rugged, magnificent peaks cleft a jagged skyline above the glacial lake, and it's all within reach of our A-star helicopter. 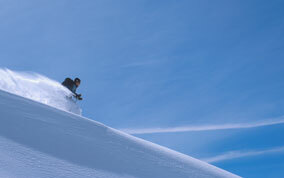 Choose from daily, weekend or multi day heliskiing packages to create the heliskiing adventure that's perfect for you. Forty years of experience come together at Canadian Mountain Holidays to create a ski experience that is truly world class. 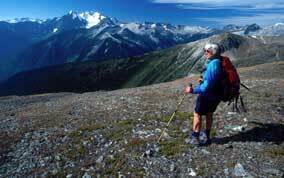 CMH offer numerous skiing and boarding destinations and packages throughout southeast B.C. Powder ski, board and snowshoe touring packages take backcountry explorers deep into mountain ranges and parks with knowledgeable guides. Based in nearby Meadow Creek, Selkirk Wilderness Skiing offer exclusive snowcat access to legendary powder terrain. This is the skiing and riding you've been dreaming of, made true by billowy deep, dry powder (up to 10 metres or 400 inches annually) and vast untracked and wide-open bowls. You'll ski or ride up to 5,600 metres (18,000 feet) of fresh vertical per day with typical runs between 465 and 1,240 metres (1,500 and 4,000 feet). Snowcat skiing on 6,880 hectares (17,000 acres) of deep powder in Bad Shot range of the Selkirk Mountains. Highland boasts a new post and beam lodge and vertical runs of 255 to 1,020 vertical metres (1,000 to 4,000 vertical feet). Valhalla Powdercats offers big country: its terrain is six times the size of Whistler and Blackcomb combined. This heli-service caters to strong skiers and boarders with a passion for deep snow and challenging runs. Ski to the edge of gravity with Meadow Creek-based White Grizzly Cat Skiing. With the firm belief that �hibernation is for wimps,� White Grizzly delivers 40 degree pitches and 1,000-metre (3,200 feet) runs on some 25 square kilometres (8,000 acres) of terrain in the Selkirk Mountains' Goat Range. Owners Carol and Brad Karafil share their passion for the outdoors and steep and deep powder skiing with just 12 people or fewer a day. Guests can expect to be treated to the highest level of service at every turn. 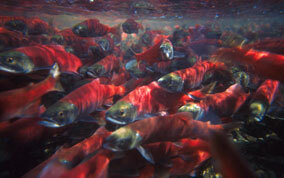 Revel in the warmth, comfort and soothing waters of the Ainsworth Hot Springs Resort. These natural mineral springs, which are cooled to a comfortable 42� C 114� F can be experienced two ways: outside against the backdrop of nearby mountains and inside in natural caves. Plus there's a bracing cold water plunge. Chill out, warm up or take it easy any time of the year. Fine dining is also offered. Cody Caves Provincial Park at Ainsworth is a true subterranean wonder; caves are filled with stalactites, stalagmites, soda straws, waterfalls, an underground stream and eons-old limestone. A variety of spelunking (cave exploring) tours are available. Children must be 5 and up for family tours and 13 and up for adventures tours. Guides are required for all cave tours.